Colour in the Angel of the North -admittedly a much smaller version than the real Gateshead sculpture! Colour in the glorious Canterbury Cathedral! This would be a fun addition to a project on Thomas Beckett, or Canterbury. Here's a colouring page of the Clifton Suspension Bridge, with the River Avon far below! Here's a colouring page of Shakespeare's Globe Theatre to print and enjoy. It's not quite what we expect a theatre to look like today! Remember, as a Tudor building, much of the outside would be dark-stained beams and whitewash. Here's a lifelike colouring page of the HMS Victory to colour in - perfect for a visit to Portsmouth, a perhaps lesson about Admiral Lord Nelson or the Royal Navy. The real London Eye has 32 'pods'. Our simplified London Eye colouring page is great for younger children. Here is another in our set of London landmarks colouring pages. This one features Nelson's Column. You'll need your red colouring pens for our traditional postbox colouring page. The kids in this colouring page are celebrating St George's Day with England flags and patriotic clothes. It's a fun page to colour in for other patriotic occasions too – perhaps an England rugby game? Here's a simple colouring page of Stonehenge, showing as closely as possible the positions of the stones. Mysterious, isn't it! Here's a colouring page of the Tudor rose emblem - England's traditional floral heraldic emblem.You could do a Google image search to see how it should be coloured in. 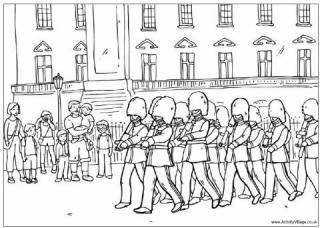 Take a virtual colouring tour of London with our popular, detailed London colouring pages for older children!